COLUMBUS — This is the time of year when Ohio residents begin gathering deductions and receipts to file their taxes before the April deadline. The Ohio Department of Natural Resources (ODNR) is asking Ohioans to consider showing their love of nature by donating a portion or all of their state income tax refund to support Ohio’s state nature preserves and wildlife. “The tax refund donations Ohioans generously give to ‘State Nature Preserves’ and the ‘Wildlife Diversity Fund’ continue to help provide protections for Ohio’s most threatened and endangered natural landscapes and species,” ODNR Director James Zehringer said. Many Ohioans may want to consider donating to the “Wildlife Diversity Fund.” The ODNR Division of Wildlife was originally created during a time when wildlife populations were vanishing at an alarming rate across Ohio. The mission of the division was and still is to manage, protect and restore wildlife populations to improve quality of life for Ohioans. Nearly all wildlife conservation in Ohio is funded by people who hunt, fish and trap. The tax donation program is an important way for all wildlife enthusiasts to help restore and manage endangered and threatened wildlife and other species of special interest. Donations to the “Wildlife Diversity Fund” benefit wildlife projects across the state, like introducing peregrine falcons and reintroducing some native Ohio species, such as trumpeter swans and Karner blue butterflies, as well as increasing numbers of rare species such as Lake Erie watersnakes, bald eagles and hellbenders. The Wildlife Diversity Fund also allows ODNR to form partnerships with Ohio’s zoos to help create exhibits and displays, as well as educational products and publications for students, teachers and wildlife enthusiasts. Ohioans may also want to consider giving a donation to support Ohio State Nature Preserves. The ODNR Division of Natural Areas and Preserves oversees a statewide system of 136 unique state nature preserves that are open year-round for people to visit and explore. These beautiful natural areas protect a variety of habitats, such as wetlands, prairies and old growth woods, as well as geologic features and endangered species. Tax refund donations are used to support new trails, educational signage and land conservation. Recent projects funded by donations include new footbridges at Conkles Hollow in Hocking County and Chaparral Prairie in Adams County; new interpretive signs at Headland Dunes in Lake County and Culberson in Clinton County; and trail improvements at Miller Nature Sanctuary in Highland County and Gross Woods in Shelby County. Donations are also critical in the fight against non-native plants, such as Japanese stiltgrass, which is a serious invader of woodlands in southeast Ohio, and glossy buckthorn, which continues to negatively impact our best wetland habitats at state nature preserves, such as Gott Fen and Kent Bog in northeast Ohio. When individuals make a tax donation to Ohio’s State Nature Preserves when filing their taxes, they are helping to ensure the biodiversity of habitats, such as Ohio’s prairies, old growth forests, wetlands and rare geologic formations, are protected. By protecting these natural areas and preserves across the state, visitors are able to enjoy activities, such as hiking, photography and birdwatching. Ohio State Nature Preserves provide habitat for many endangered species and enhance the quality of life within Ohio’s communities. By making a tax donation to either Ohio State Nature Preserves or the Wildlife Diversity Fund, Ohioans are helping us ensure the future of Ohio’s many plant and animal species and ecosystems for years to come. For more information on Ohio State Nature Preserves and how to make a tax donation to support them, visit www.naturepreserves.ohiodnr.gov/support. For more information on the ODNR Division of Wildlife and the Wildlife Diversity Fund, visit www.wildohio.gov/support. File photo When individuals make a tax donation to Ohio’s State Nature Preserves when filing their taxes, they are helping to ensure the biodiversity of habitats, such as Ohio’s prairies, old growth forests, wetlands and rare geologic formations, are protected. By protecting these natural areas and preserves across the state, visitors are able to enjoy activities, such as hiking, photography and birdwatching. 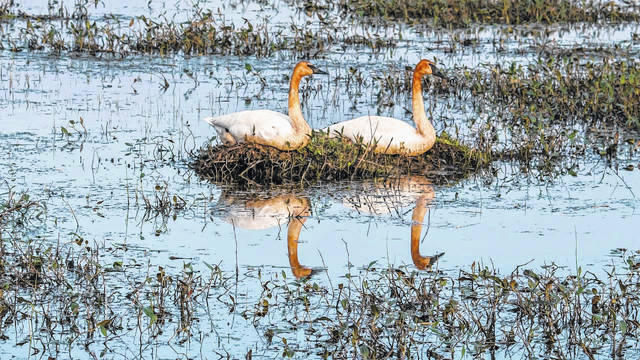 https://www.galioninquirer.com/wp-content/uploads/sites/38/2018/02/web1_Magee-Marsh.jpgFile photo When individuals make a tax donation to Ohio’s State Nature Preserves when filing their taxes, they are helping to ensure the biodiversity of habitats, such as Ohio’s prairies, old growth forests, wetlands and rare geologic formations, are protected. By protecting these natural areas and preserves across the state, visitors are able to enjoy activities, such as hiking, photography and birdwatching.